"It was Saturday morning," she said. "Police came to my door." "Last night I'm in the house and I'm just roaring in tears," Latham-Morris said. "I'm saying, 'No, it's Jamal! It's my son that's gone! I'm never going to see him again!'" Our review of crash data comes as the city is experiencing significant growth in bicycle use. Federal census data shows that Philly has the highest percentage of residents biking to work of any major U.S. city. The NBC10 Investigators examined records for every Philly bike crash since 2014 – more than 1,500 of them. We discovered crashes spike to an average of more than 80 per month beginning in June. That spike continues through summer and peaks in September, when the average number of bicycle-involved crashes rises to 95. Most crashes happen in the afternoon and evening hours, rather than morning hours. We found location patterns, too. Broad Street shows up more often than any other street in crash records: 76 crashes in just two-and-a-half years of reports. Spruce Street had 63 crashes, even with its painted bike lane. Sarah Clark Stuart, Executive Director of the Bicycle Coalition of Greater Philadelphia, is focused on one of the leading causes for crashes that turn deadly: speeding drivers. 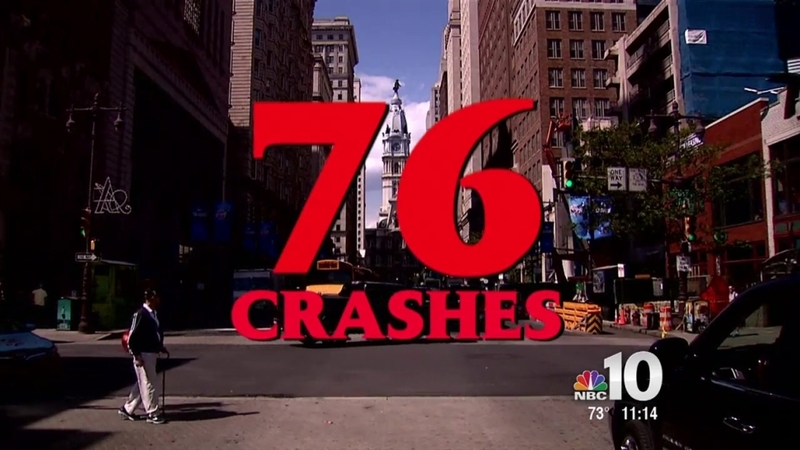 "Speeding is what causes a third of the fatalities in Philadelphia," she said. "It is one of the most important issues." Philadelphia Police Captain John Wilczynski, the head of the Philadelphia Police Department's Accident Investigations, agrees that speeding is one of the most common crash concerns. "Speed is a factor in every crash," he said. "Every crash that we investigate, whether it's auto versus auto, auto versus bicycle. Speed is always a major factor and something we look into." Stuart and other cycling advocates are now pushing Pennsylvania legislators on a plan to improve safety by targeting those speeding drivers. Advocates want approval to extend the state’s red light camera program, add photo speed enforcement, and allow local police to use radar. The plan has opponents. Larry Tarr of the National Motorists Association says red light cameras and photo speed enforcement ticket even drivers who try to follow the rules. He also believes giving local police speed radar would distract them from more dangerous problems, like aggressive driving or tailgating. "It's not about safety at all," Tarr said. "It's about money. If we give them radar they're going to be told, 'Okay, we got the radar. We paid for it. Now go out and use it.'" Latham-Morris disagrees however and has pledged to take her push for policy change to the highest city and state leaders. She told NBC10 her son's death demonstrates the urgent need for new approaches. The hit-and-run driver who struck and killed him still hasn't been found. "I'm asking, please come forward," she said. "You cannot bring my son back but you can make a difference in someone else's life." The city is planning changes intended to improve cyclists' safety, including a redesign of more than a dozen street corridors that would include "protected" bike lanes that are physically separated from vehicle traffic by curbs or parked cars. Advocates acknowledge their full list of safety recommendations would likely require a Streets Department budget twice as large as the current one.